With its remarkable rarity and unique gemstone qualities, it’s no wonder experts have dubbed tanzanite, “the gemstone of the 20th century.” In recent years, top-quality tanzanite gems have fetched higher prices at auction than many rubies, emeralds or diamonds! So, when we had the opportunity to pile on the carats of this rare gem, we moved lightening quick. The result is our Tanzanite Opulence Bracelet—a collection that carries the heaviest total carat weight of precious tanzanite we’ve ever offered. 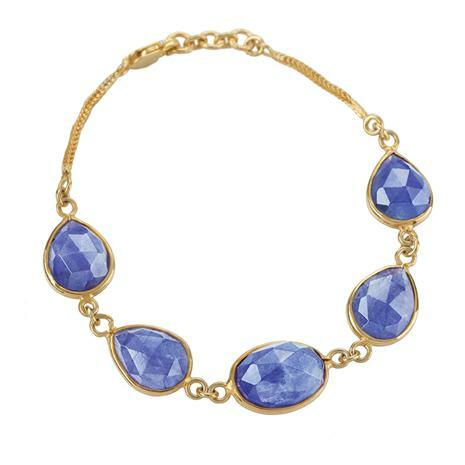 The bracelet packs 22 total carats in a dozen teardrop tanzanite stones. What makes tanzanite so irresistible is its beautiful violet blue color. It’s unlike any color you’ve seen. A color that mimics a gorgeous mixture of the best sapphire, amethyst and blue topaz. Unlike other gemstones, which are mined all over the world, tanzanite can be found in only one place on Earth: in the remote Merelani Hills in the shadow of Mt. Kilimanjaro in Tanzania, Africa. We have a feeling we’ll shed the carat weight of this rare gem in no time. So indulge in the “Gemstone of Century” before it’s gone. At this price, you’ve got nothing to lose.